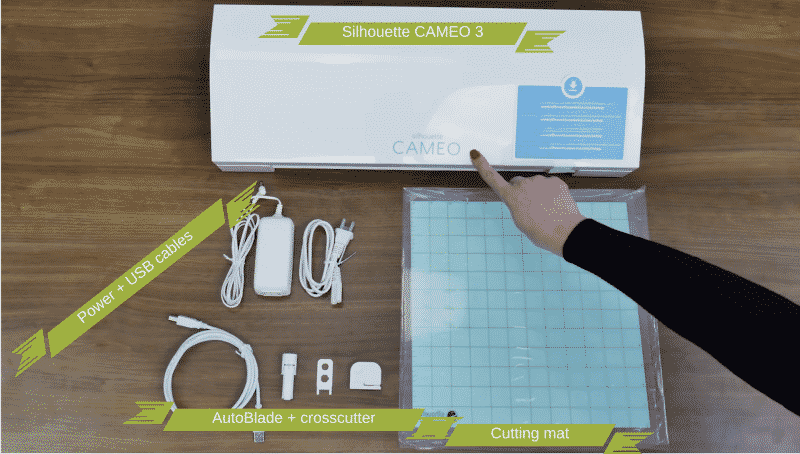 Silhouette Cameo 3 Review: Best and Worst Features | Cut, Cut, Craft! The Silhouette Cameo 3 is the newest machine I’ve reviewed from Silhouette, replacing the popular and much-beloved Silhouette Cameo 2. You’re probably wondering if this machine actually holds up to all the hype. Is it worth it to upgrade from an earlier model? What’s the difference between the Silhouette Cameo 2 and Cameo 3? I’ll explain in detail what makes the Cameo 3 the best machine from Silhouette so far. Not only will I highlight the 5 best new features of the Cameo 3, but I’ll also cover the few major issues it has. Where can I buy a Silhouette Cameo 3? What can I make with a Silhouette Cameo? Should I upgrade from the Cameo 2? 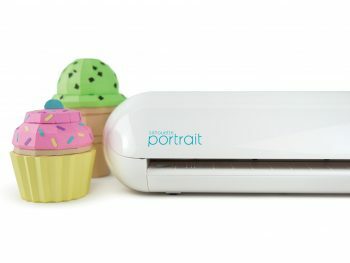 Can I use the AutoBlade with other Silhouette machines? Which version of Silhouette Studio should I get to use with SVG images? Do you have to be connected to the internet to use the Cameo 3? Does the Silhouette Cameo 3 work with normal cutting mats? How large is its cutting mat? Can the Cameo 3 etch glass? Can the Cameo 3 cut foam board? Can I make jigsaw puzzles? Can the Silhouette Cameo 3 etch metal like jewelry or pet tags? Can I use the Cameo 3 with multiple computers? Will the Silhouette Cameo 3 fit in the rolling tote? Is this machine compatible with the vinyl roll feeder? Is there another new Silhouette machine being released soon? Which vinyl should I start with? The Cameo 3 was introduced last year and represents the newest model from Silhouette’s best-selling Cameo line. At first review, it sits on the desk like a gorgeous, sleek printer. 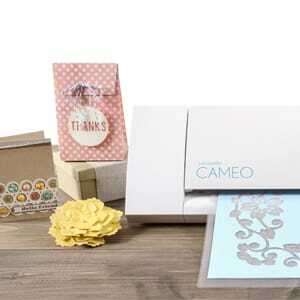 But instead of printing ink onto a page, the Cameo 3 can cut and draw on over 100 different types of material. Let’s start with a brief table that summarizes the Cameo 3’s attributes. Then I’ll run through the newest features of this machine and the important pros and cons. I’ll break down all of the Silhouette Cameo 3’s features in an easy-to-read format, so you can determine if it is the right cutting machine for you. In a bit I’ll cover the best Silhouette Cameo 3 bundles and deals (feel free to skip ahead), as well as an FAQ. I’ll begin with a quick review of the Silhouette Cameo 3’s best new features, and then I’ll break down all the essential details of this machine. AutoBlade. This new blade from Silhouette automatically adjusts the cut settings for the material selected in Silhouette Studio. No more having to ratchet the blade settings by hand! Dual carriage. With two holders for blades and pens, the Cameo can now sketch and cut at the same time. You no longer have to stop and switch out the blade to get this multi-functionality. Deeper cuts. The increased clearance allows cutting materials up to 2 mm thick, more than twice what the Cameo 2 could handle. Silhouette Studio 4. The latest update to Silhouette Studio makes this design powerhouse even better. Bluetooth. This is the first Cameo that has wireless capabilities. I think we all could use fewer cables in our lives. I’ll go through each of these features in detail below. But first, I’ll review the pros & cons of the Silhouette Cameo 3 so you can get an idea of what this pretty machine is all about. After that, I’ll give an overview of the Cameo 3’s specs, and what comes in the box. So, what exactly comes with the Silhouette Cameo 3? 12″ cutting mat. This is how material is usually loaded into the Silhouette. It is sticky on one side for securely holding the material while it’s being cut. This will need to be replaced every 4-12 months, depending on usage. (1) AutoBlade. A cutting blade that automatically adjusts to the cut settings you choose in Silhouette Studio. This will need to be replaced every 2-8 months, depending on usage. (1) Crosscutter. A very useful tool for cutting rolls of vinyl. 1-month basic subscription to Silhouette Design Store. This gives you a $25 credit to the marketplace, with access to hundreds of thousands of designs. 1-year limited manufacturer’s warranty. This applies only to the hardware and cables, not for consumables like the blades and cutting mats. Alright, let’s talk about those last two specs a bit. If you’ve used the Cameo 2 before, you’ll notice that the biggest change with the Cameo 3 is that it’s, well, bigger! The Cameo 3 is longer, wider, and weighs more than the Cameo 2. However, with most of the machine covered by the nicely curved lid, the Cameo 3 manages to keep a clean and streamlined design. It has an incredibly sleek look that looks fabulous sitting in your crafting area. I think overall the Cameo 3 is definitely a more attractive model than the previous Cameo. The Cameo 3 also has improved storage over the Cameo 2. 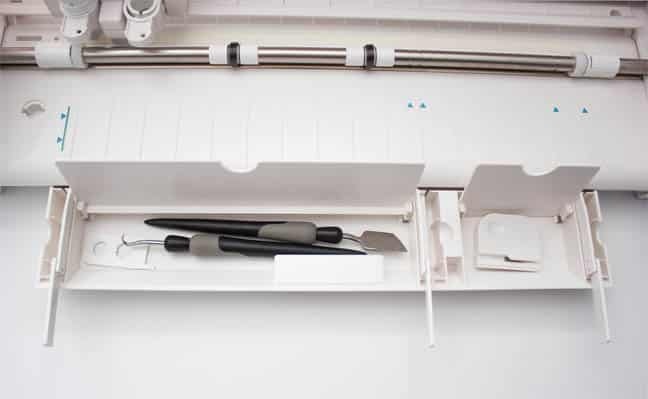 There is an easy-to-access storage compartment on the left, which contains space for two extra cutting blades or pens, which you should always have on hand. The long storage underneath is the most useful, with a small compartment for the vinyl crosscutter, and a larger compartment for more blades and pens. And that bottom storage compartment now has plastic arms that flip out to help support your cutting mat. It’s super useful and prevents your mat from curving or getting misaligned as it is fed into the Silhouette. It’s even got some neat cable management in the back! Along with the new Bluetooth capabilities, it’s much easier to get this Silhouette hooked up and cutting, without having a mess of cables and supplies cluttering up your crafting space. As I mentioned, the Cameo 3’s lid now extends to cover much of the body, including the touchscreen. I definitely appreciate having a protected touchscreen, rather than one that is exposed while the machine is being moved around. The touchscreen now features a series of easily-accessible tutorials that help with those who are new to the Silhouette family, or to cutting machines in general. 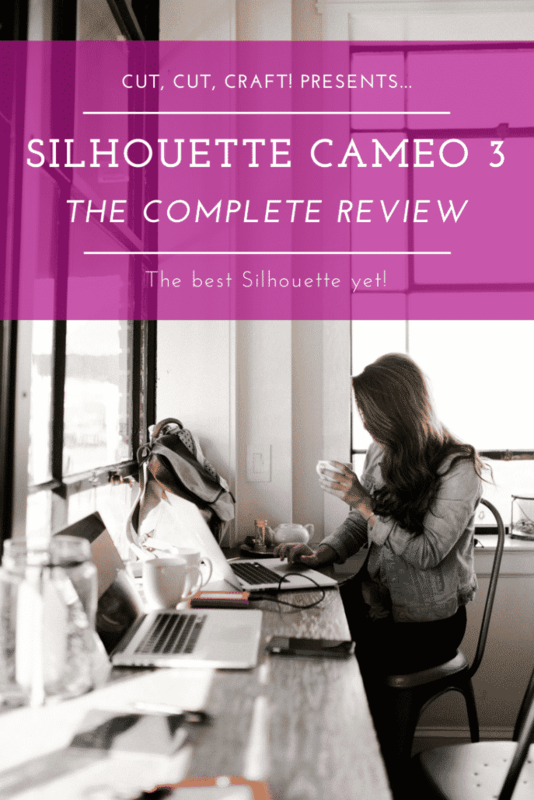 The Silhouette Cameo 3 is the easiest Silhouette to use yet! I’ll show you all the best new features responsible for this improved usability. The AutoBlade marks the biggest quality of life improvement and it is only compatible with the Silhouette Cameo 3 and the new Portrait 2 (full review here). Instead of having to ratchet your blade to the right number for cutting, it can now adjust automatically! I don’t think I could ever go back to having to manually adjust the cutting blades. If you’re like me and you sometimes mess up a cut by forgetting to set the blade, or just get annoyed at having to change the settings when you switch materials, the AutoBlade alone is enough reason to upgrade to the Cameo 3. The dual carriage allows the Silhouette Cameo to hold two different tools at once. 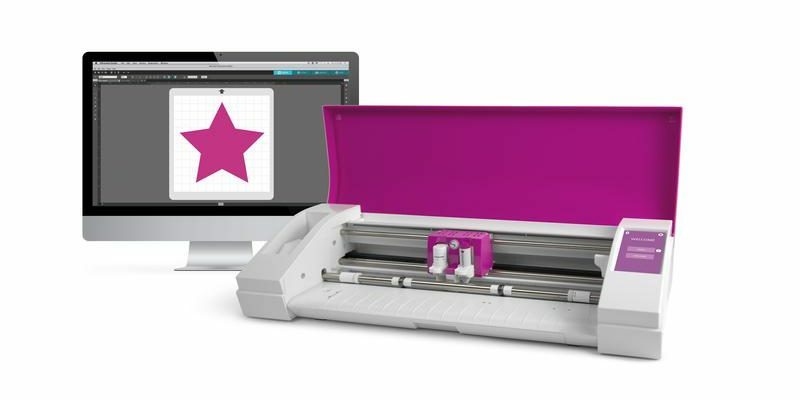 This lets you draw and cut, or cut and emboss, without having to switch out one tool for another. You can, of course, place two different colored pens in the dual carriage as well. I found that this actually expands how I design text to be written and drawings to be sketched. However, it also makes me wish for a carriage that can hold, oh, eight different colored pens. Is that too many? Don’t worry, the Cameo 3 dual carriage will still work with all the old Cameo blades and pens. So if you have leftover tools from older models (or just prefer being a bit old school) you can use them with the Cameo 3. 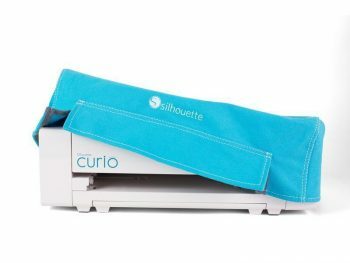 The other Silhouette machine with a dual carriage is the diminutive Silhouette Curio, a small-form machine designed for cutting and embossing. Only the Cameo 3’s dual cartridge, however, is capable of using the (magical) AutoBlade. The Cameo 3 is the first Silhouette featuring new adjustable rollers. The white pinch rollers have a much easier adjustment mechanism, just twist and slide. The new steel spring rollers are gentle on material, but are now fully adjustable in case you need to slide them out of the way to avoid indenting or damaging delicate material like craft foam or foils. Now that I’ve gone over how the new Cameo looks and feels, let’s move on to how she cuts! 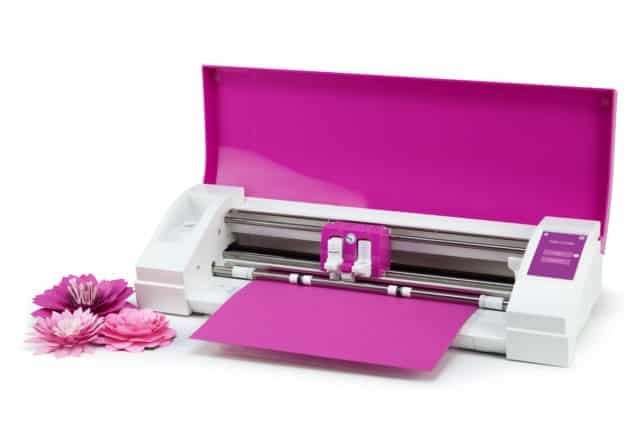 The Silhouette Cameo 3 can cut materials over two times thicker than the Cameo 2! This is the Cameo 3’s biggest upgrade to cutting ability. The cutting bar now allows for a 2mm clearance, improved from 0.8 mm. This means that, combined with the Deep-Cut Blade, you can now cut thicker materials like craft foam, which my kids love. The Silhouette Cameo has always been the personal cutting machine of choice for those who want to take advantage of the Cameo’s ability to cut longer materials. This is an essential ability for making vinyl signs, banners, and even wall decals. It doesn’t just save you time and effort of having to load multiple sheets into the machine, but it actually improves the quality of the cuts and reduces the chance for mistakes. 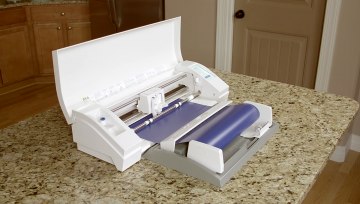 The Cameo 3 maintains the ability of the original Cameo to cut materials up to 10 feet long. And truthfully, the ability to cut long materials is the most obvious advantage the Cameo has over most other cutting machines. The Cameo is able to cut long materials because you don’t have to stick your material to a cutting mat to run it through the machine. This Silhouette can do matless cutting on lined media (like regular adhesive backed vinyl). 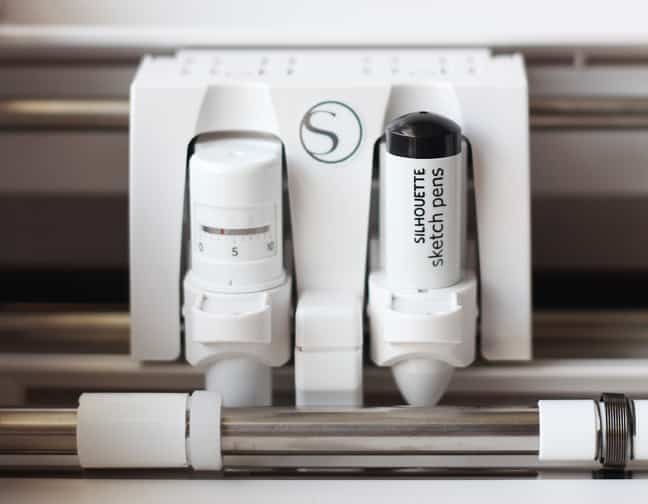 Silhouette even has a vinyl roll feeder that can attach and feed vinyl straight into your machine. When used with the vinyl crosscutter, you can slice off your decals or banners right as they are cut. 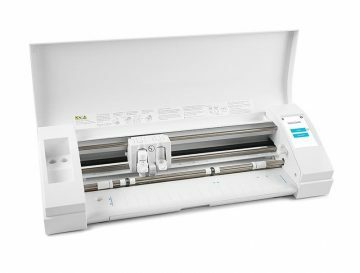 If you are planning on cutting projects between 2 and 10 feet long, the Silhouette Cameo 3 might just be the perfect machine for you. The biggest drawback to the Silhouette Cameo 3 is that it still has the same, rather weak, cutting force of the original Cameo. The Cameo 3 cuts at 210 gf, which is weaker than the comparable machine from Cricut, the Explore Air 2. Thankfully, you won’t notice this at all when cutting thin materials like paper or vinyl, or thick and light materials like craft foam. The Cameo 3 also struggles with thin but dense materials, like acetate or metal. The machine might not be able to cut them at all, and they can even damage the blade. The increased clearance of the Cameo 3 allows it to cut a broader range of material than any previous Cameo machine. It can cut through hundreds of different materials, so don’t take this as a comprehensive list. Alright, if you’ve been around my site a bit, you’ve probably heard me go on a bit about Silhouette Studio. When it comes to cutting machine software, the fantastic Silhouette Studio is my favorite, hands down. However, software preference often comes down to you what you know and what you like. 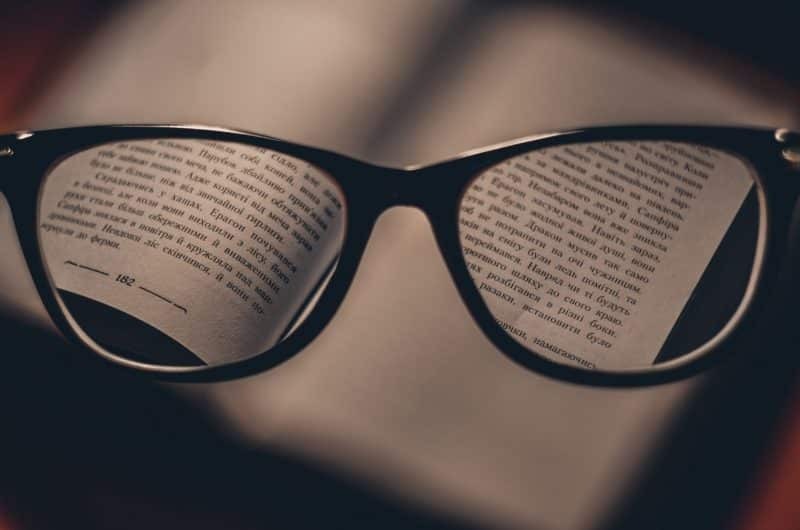 Some people will prefer one program due to previous experience, or find another to just be more intuitive for how they work. Silhouette Studio is free to download and try out. 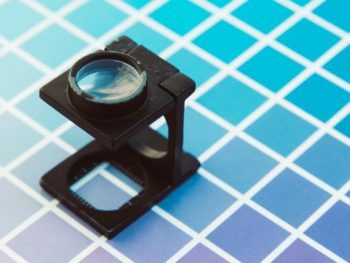 So if you think that the design software might determine which machine you choose, you can download them, play around, and make an informed, personal decision. Silhouette Studio is pretty easy to use, once you have spent a bit of time learning how it works. I found the interface intuitive, but lots of people need some help getting started and finding their way around. If you have any trouble there are guides in the program, as well as a bunch of really helpful YouTube tutorials that show you how to use every feature, like this playlist from Silhoutte’s official channel. You can even customize the design interface so all the features you use the most are easily accessible. Despite its apparent simplicity, Silhouette Studio is a surprisingly powerful design software, letting you import, purchase, create, and edit uncountable designs with a multitude of tools. I love being able to Print & Cut for making colorful stickers, temporary tattoos (yep! ), and 3D paper crafts. Silhouette Studio prints out registration marks that are read by the Silhouette to ensure the cuts are aligned properly with the printed material. Check out this comparison chart showing full list of features in the Basic, Designer, and Business Editions. 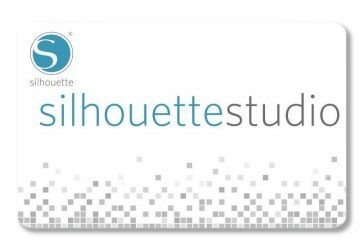 Silhouette Studio 4 is compatible with Windows 7 & higher, and Mac OSX 10.7 & higher. The biggest drawback to Silhouette Studio is that the free, basic version doesn’t support importing or exporting SVGs or PDFs. You’ll have to upgrade to the Designer Edition ($50) to be able to import SVGs and PDFs and to the Business Edition ($100) to export JPGs, SVGs, and PDFs. With the Silhouette Connect plug-in, you can send projects to your Silhouette directly from Adobe Illustrator or CorelDRAW. 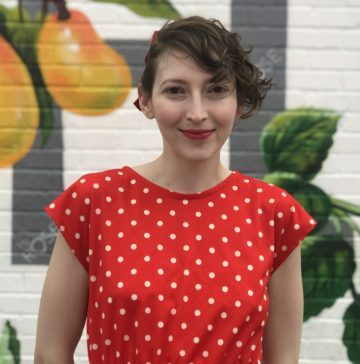 This is a fabulous feature for those who have experience with these design programs, or for anyone who prefers to learn a professional design software and skip out on Silhouette Studio. Silhouette Connect costs $39.99, though you can find it for cheaper on Amazon. The Design Store is Silhouette’s online marketplace that contains hundreds of thousands of designs for you to browse and purchase. You can access the Design Store from Silhouette Studio (by clicking “Store” in the top right) or through the web by going to SilhouetteDesignStore.com. In the Design Store, you can browse, search, and purchase designs, fonts, 3D paper crafts, patterns, and projects (complete with tutorials). The 1 month Basic Subscription to the Design Store (included with the purchase of a Cameo 3!) gives you a $25 credit to purchase designs. Since most designs cost $.99, this means you get an additional 25 free designs, that you get to pick out. Silhouette Cloud helps you sync all your designs—those you’ve purchased and those you’ve created—across all your devices. Once you sign in to the cloud in Silhouette Studio, it automatically downloads all your Design Store purchases to your computer, which makes them accessible later even without an internet connection! This is one of the best features of Silhouette Studio compared to the other design software in the industry. 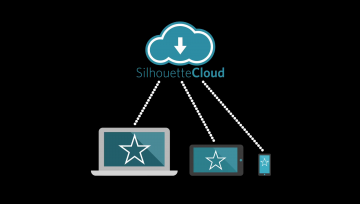 You can sync up to five (5) devices with Silhouette Cloud. There is unlimited storage for Design Store purchases and 1 GB storage for custom designs. (The custom design storage increases to 5 GB with a Design Store subscription or Club Silhouette membership). The Cameo 3 is the first Silhouette machine with Bluetooth capabilities, an essential improvement over the Cameo 2. Bluetooth lets you connect wirelessly to your computer, iPad, iPhone, or Android device. With 100 foot range, you can set up your Silhouette anywhere you want, without being tethered to your computer. If you have any trouble setting up your Bluetooth connection, Silhouette has a great how-to page to help you get set up. 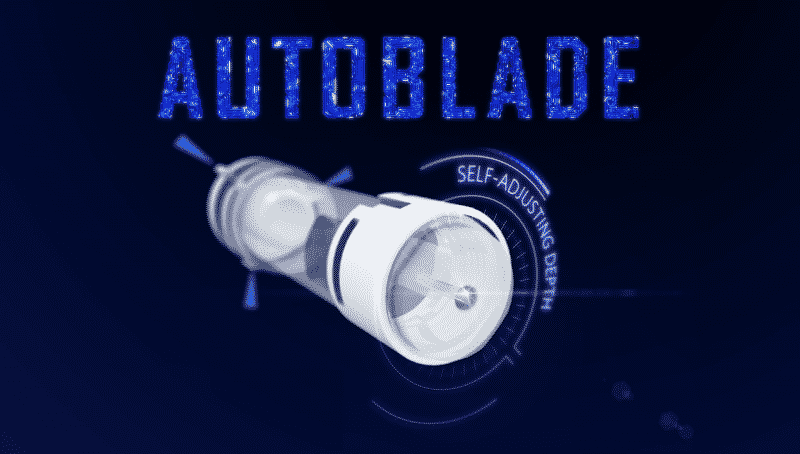 AutoBlade. Automatically adjusts cut settings. Standard Blade. AKA the ratchet blade. Fabric Blade. Same as the standard blade, but in a different color to distinguish it for fabric-use only. Premium Blade. Lasts 3x as long as the standard blade. Deep-Cut Blade. Cuts materials up to 2mm thick. Sketch Pens. 24 colors now come with now with 2x the ink. Pen holder. Can hold 3 different sizes of pens and markers. 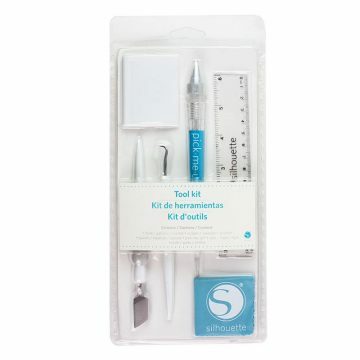 The embossing, stippling, and etching tools made by Silhouette claim to only work with the Curio, and are not designed to work with the Silhouette Cameo. However, there are some off-brand embossing and etching accessories that will work! The Pick-Me-Up is the most interesting one out of the bunch. It has an extendable sticky tip for picking up bits of paper, vinyl, or rhinestones. The Silhouette brand cutting mats work just fine. They aren’t quite as good as the Cricut mats, being a bit more expensive while not lasting as long. And as I mentioned above, the vinyl roll feeder, combined with the vinyl crosscutter, provides a super smooth experience for cutting long materials or multiple designs out of a roll of vinyl. Alright, that’s all of the interesting features of the newest Silhouette Cameo! On to a bit of the fine print, and then I’ll wrap this up with some of the best bundles to purchase followed by an FAQ. Silhouette offers a one-year limited hardware warranty from the date of purchase. This warranty is voided by any commercial use. The warranty covers the machine, as well as the power and USB cables. Silhouette will replace any defective parts for only the cost of shipping. …if your friend Stacey steals it because she is jealous. So make sure to keep Stacey away! The Silhouette Cameo 3 is a solid machine, a great value, and the best Silhouette machine you can get today. It keeps all of the great features of the Cameo 2, while adding Bluetooth, the ability to cut thick materials, as well as a few incredible quality of life improvements. I could not go back to cutting on a Silhouette without Bluetooth, the AutoBlade, and the ability to use two tools at once. Unfortunately, Silhouette still has not improved on the mediocre cutting power of the Cameo series, so it can’t easily handle dense or tough materials. If you want to cut long materials, the Silhouette Cameo 3 is a great choice. When you’re ready to finally get your own Cameo 3, make sure to check out these great bundles. They tend to sell out, so I’ll keep updating this article with a current batch. If you’re thinking about purchasing the Cameo 3, you obviously want to make sure the machine you’re getting works and that you find the best deal. Many retailers are selling what is known as “grey-market” machines that come either without a warranty (because they’re refurbished or repackaged) or if you need repairs you’ll have to ship the machine to another country (and wait quite a while). That’s why I’ve made sure all of these deals are current (as of July, 2018) and come with the original manufacturer’s warranty. If you have any questions, check out the FAQ below. I might have already answered them! If not, drop me a comment. 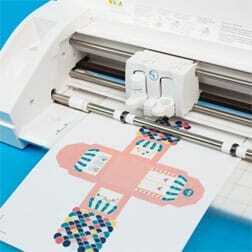 You can purchase the Silhouette Cameo 3 at craft stores like Michaels or JOANN Fabrics. However, I recommend looking online because you can usually find better prices, especially if you go for a bundle deal. Just above this FAQ I have a section outling the best current deals. Oh, the possibilities are actually limitless! You can make stickers, vinyl decals, cards, gifts, invitations, paper crafts, etched glass, scrapbooks, holiday decor, magnets, kids crafts, accessories, stencils, sketches, labels, stamps, temporary tattoos, 3D projects, and school projects. Think that’s enough to get you started? While the Cameo 3 is a valuable improvement over the Cameo 2, if you are happy with the 2 I think the Cameo 3 is a non-essential upgrade. Most of the best new features will make the machine easier to use and improve your quality of life while cutting. Features that would swing you towards upgrading: Bluetooth, cutting materials twice as thick, and the dual carriage with AutoBlade. Personally? I upgraded and gave away my Cameo 2 to a niece who wanted to get started. The only other Silhouette that can take the AutoBlade is the new Portrait 2. You can’t use it with the Cameo 2, or with the Curio’s dual carriage. It depends on what you want to do! I’m a huge fan of all the features in the Business Edition, but they aren’t necessary for everyone. If you want to be able to download free SVG files, then you should at least upgrade to the Designer Edition. But you can always start off with the free Basic Edition and upgrade whenever you need to! Nope! One of the reasons why I love Silhouette Studio is that it downloads all your home-made and purchased designs to your computer or device, so you can design, edit, and cut without being connected to the internet. Yes! The Cameo 3 works with the same cutting mats as the Cameo 2. Silhouette also makes long cutting mats, which measure 12 in x 24 in. Yes, the Cameo 3 can etch glass using stencil paper and glass etching cream. Yes! You can absolutely cut craft foam or foam board to make jigsaw puzzles. You’ll want to use the Deep-Cut blade for any materials that are more than 1 mm thick. Yes. On soft metal the Cameo 3 can engrave with just one or two passes. Harder or denser metals will take more passes because the Cameo 3 does not have a powerful cutting force. Yes, you can sync up to five devices or computers with one Silhouette account. Unfortunately, because the Cameo 3 is bigger than the 2, it will not fit in the rolling tote, or many other cases for the Cameo 2. Yes, the Silhouette Cameo 3 works beautifully with the roll feeder and included vinyl cross cutter. Yes! But it’s not a cutting machine. The Silhouette Alta, Silhouette’s first 3D printer, will be released in June 2018! You can read all about it on Silhouette’s blog. There also will be four different glittery versions of the Cameo 3 released in 2018. I suggest starting off with a variety: some cling vinyl, heat transfer, and adhesive. I go over the very best vinyl for Silhouette machines in this post. Thank you for the review. I am wondering if there are other colors available? Currently, no, but Silhouette does have limited runs of color from time to time and I’ll update the post as they are released! One thing no one is mentioning that is important to me is how small of an image or shape can it print? For instance can I print letters 1/8″ tall? I want to use it to create stencils for painting on model kits and some of the images can be quite small. I am getting too deep of cuts and have tried everything online to rectify it. The auto blade is not getting back to 1 on force and thus is cutting through vinyl. Any suggestions?